TMCnet grows daily with thousands of new news items and stories. As the site grows, we are always looking for ways to improve. One of these ways is to develop community pages which focus on a particular subject matter such as HD Voice, IP communications, IPTV, CRM and hosted communications or outbound call center. Today we just announced TMCnet's WiMAX Today, a new site devoted to the WiMAX space. You probably already know TMCnet as a site which has more WiMAX news, information, opinion and analysis than any other site online. Now you have a single place where you can go on the site to keep up with virtually every topic in this fast-growing wireless market. I personally invite you to visit wimaxtoday.tmcnet.com for more. \nTMCnet grows daily with thousands of new news items and stories. As the site grows, we are always looking for ways to improve. One of these ways is to develop community pages which focus on a particular subject matter such as HD Voice, IP communications, IPTV, CRM and hosted communications or outbound call center. 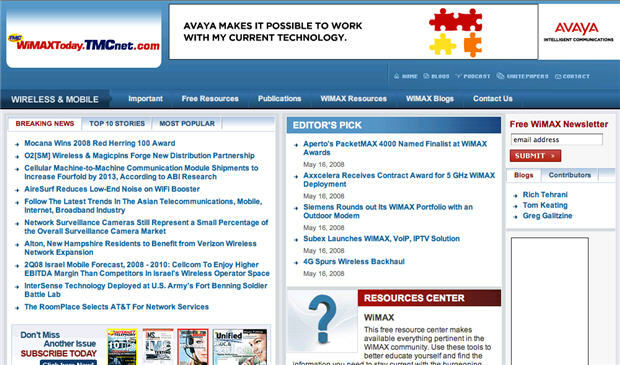 \nToday we just announced TMCnet's WiMAX Today, a new site devoted to the WiMAX space. You probably already know TMCnet as a site which has more WiMAX news, information, opinion and analysis than any other site online. \nNow you have a single place where you can go on the site to keep up with virtually every topic in this fast-growing wireless market. \nI personally invite you to visit wimaxtoday.tmcnet.com for more.